TORONTO, ON – Remember Ubuntu for Android? The effort by Canonical to bring the free open-source operating system to smartphones was fraught with ambitious price points, failed Indiegogo campaigns, and perhaps a flawed approach in its attempt to supplant the Android OS on Android hardware. While the dedicated Ubuntu Phone that has emerged this year has yet to gain a mainstream audience, one thing Canonical did achieve was to show the possibilities of extending a phone’s processing power into a desktop experience. At its Device Night in downtown Toronto Wednesday night, the software – and increasingly hardware – giant showed off its holiday lineup including the Surface Book, Surface Pro 4, Lumia 950, and Microsoft Band 2. Among the glitzy new hardware running various creative and Office 2016 capabilities, however, was the company’s Lumia 950 phone running on a desktop screen through Microsoft’s much-touted Continuum feature, which allows Windows 10 devices to adapt to other form factors. With Windows 10 running everything from ultrabooks to smartphones to the Xbox One, owners of the Lumia 950, 950 XL and future Windows Phones will be able to plug into a port or dock, which then connects to a desktop monitor. Windows 10 on the smartphone then detects the monitor and switches into desktop mode, allowing the operating system to be accessed like a tower or laptop. The hardware enabling this are surprisingly minimal. Aside from the smartphone and a monitor, one needs a USB Type-C cable to plug into the device (the Microsoft rep declined to say whether the exact cable needed would come with the phone). This particular setup pictured also uses a “Microsoft Display Dock” (behind the hand in the photo) which goes between the USB cable and the TV input. While this dock does not have much proprietary tech, it does provide USB inputs for additional accessories, charging capabilities, and HDMI outputs, all of which seem quite handy. There is also support for Miracast, described as “HDMI over Wi-Fi”, although this slows down the process. While the keyboard and mouse are shown here, the rep noted that they are optional. 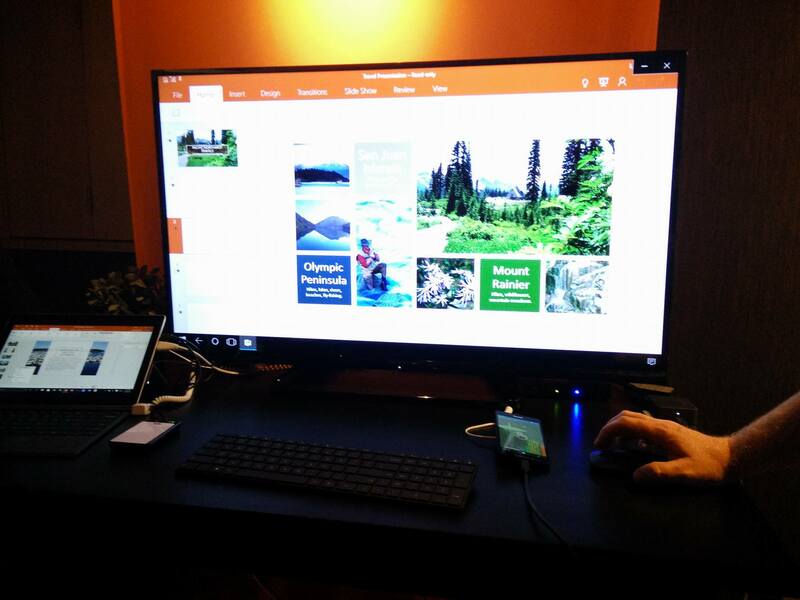 The screen of a Windows Phone can be used for input even as the device powers the desktop experience on the monitor. It goes without saying that for this type of functionality, the specs matter. While the Microsoft rep noted that the Lumia 950 and 950 XL and later models will be powerful enough to run this feature, tasks are mostly limited to document editing and browsing. It will be interesting to see whether this function, which is still unique in the market, will help Windows Phones gain traction. For now, the Lumia 950 and 950 XL only sell at the Microsoft Store for CAD $749 and $849 CAD respectively. The idea to use a smartphone as a portable desktop might not be new, but Microsoft may finally make it happen.